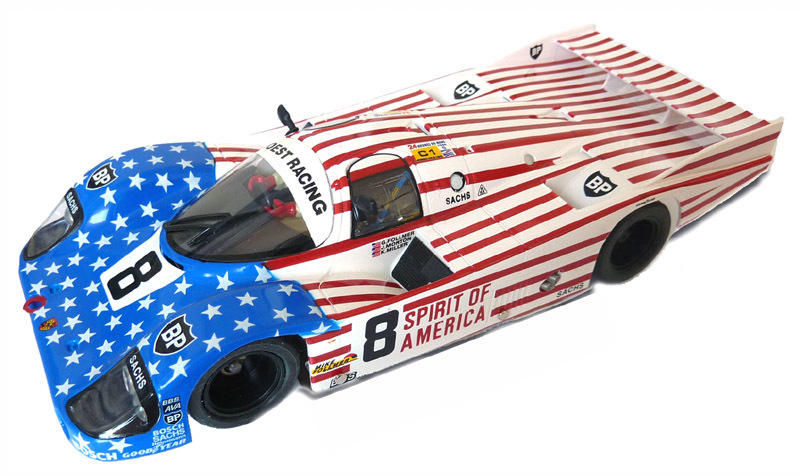 T32108S - 1/32 scale Porsche 962, 1986 Le Mans [T32108S] - $149.95 : TSR Slot Cars, TSR Slot Cars - Dedicated to Slot Car racing, collecting, restoration, track design, electronics and software. 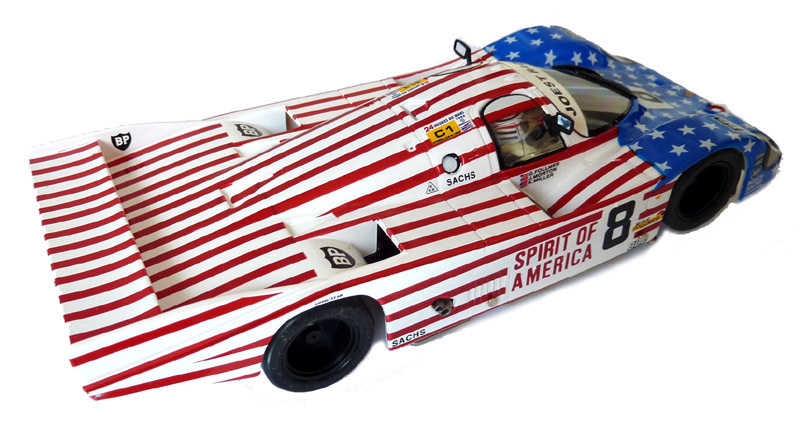 This is a model of the beautiful Porsche 962, decorated with an American flag and that finished in 3rd place at the 1986 Le Mans 24-hour race, driven by George Follmer, John Morton and Kemper Miller. Fitted with the TSR chassis and designed to outperform any commercially produced, out of the box slot car on your Carrera plastic track. This is a limited, special edition. The TSR metal body mounts protrudes 1.5mm from the body frontal edge. This allows for great body protection as the front part of the chassis will take much of the abuse that this model may encounter during hard use and frontal crashes by inexperienced drivers. This car is fitted with the T32002HPS chassis and TSR-Ortmann Urethane compound tires for use on plastic tracks or routed wood tracks where no traction compound is being used, and a TSC25 guide pin for use on the better plastic tracks, Carrera, Revell, Monogram, Atlas, Fleischmann and Artin. For Scalextric "Sport" and Ninco tracks and any track where the rails are raised above the track surface, the traction magnet may contact both, causing a short that will damage the chassis and the motor. To avoid this issue, caused by poorly engineered track designs, the magnet MUST BE COVERED WITH PROTECTIVE ADHESIVE "ELECTRICAL" TAPE. For use on Ninco track, a different, shorter and narrower guide pin, part # TSC25N, must be fitted, or the TSC25 standard guide pin must be shortened and narrowed using a Dremel cutting wheel. Please follow enclosed instructions to run on Scalextric, Ninco and similar tracks.